MINNEAPOLIS--(BUSINESS WIRE)--Apr. 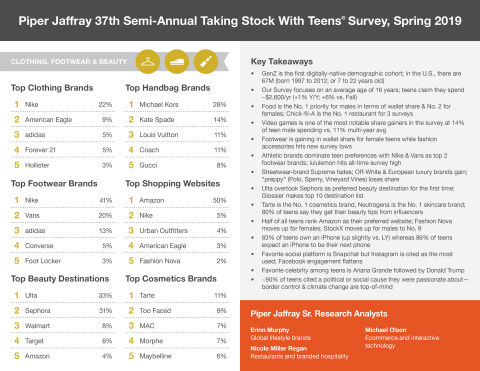 8, 2019-- Piper Jaffray Companies (NYSE: PJC), a leading investment bank and asset management firm, completed its 37th semi-annual Taking Stock With Teens® survey, which highlights discretionary spending trends and brand preferences amongst 8,000 teens across 47 U.S. states with an average age of 16. Generation Z, which contributes approximately $830 billion to U.S. retail sales annually*, represents an influential consumer group where wallet size and allocation provide a proxy for category interest. For the survey infographic and more information, visit piperjaffray.com/teens.